Internationally acclaimed modern folk trio Lau announce a European tour in support of their highly anticipated forthcoming new album (due for release in May 2015 on Reveal Records). Lau are three highly individual and extremely gifted musicians – Martin Green (accordion and electronics) Aidan O’Rourke (fiddle, fx) and Kris Drever (vocals, guitars). For a decade they have been stretching folk music’s boundaries further and exploring new musical territory with each release and concert tour. 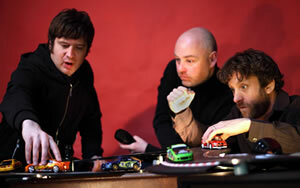 2012’s ‘Race The Loser’ album was nominated for Scottish Album of the Year and featured in many critics best of year lists. Lau appeared on BBC TV’s Later… with Jools Holland extending their audience considerably in the process and won their fourth BBC Radio Folk Award for Best Group a few months later. For their new album, The Elysian Quartet, a group that share Lau’s fearless desire to create something new through improvisation, will feature and the new recordings are produced by Brooklyn based artist and multi-instrumentalist Joan Wasser (Joan As Police Woman). What comes next from Lau promises to be their greatest musical recorded statement yet. two unique live sets, featuring all their greatest material from across the last decade. Since their debut album in 2007 Lau have picked up four awards for ‘Best Group’ at the BBC Radio 2 Folk Awards and the individual members have all won multiple awards and recognition for their acclaimed solo works. Lau has also appeared on TV on Later…With Jools Holland (BBC 2 TV). Lau is the pioneering contemporary folk trio comprising three of the UK’s finest traditional musicians: Kris Drever (vocals, guitar), Martin Green (accordion, wurlitzer, keys, electronics) and Aidan O’Rourke (fiddle). Lau has garnered four awards for “Best Group” at the BBC Radio 2 Folk Awards and also appeared on the Later… With Jools Holland TV show (BBC 2 TV). Individual members have all won multiple awards and recognition for their solo work. Kris Drever is shortlisted for Folk Singer of The Year 2017 & Best Original Track 2017, Martin Green nominated for Best Album 2017 & Best Original Track 2017 at this year’s BBC Radio 2 Folk Awards. Lau announces the release of its first ever retrospective album, Decade (The Best of 2007-2017). A compilation of the trio’s best tracks, curated by the band and manager Tom Rose from the song and tune suggestions of their very many fans. As you might expect for a band as renowned for its brilliant stage performances as recordings, Lau will be taking this retrospective material to concerts and festival stages throughout the summer of 2017 and then touring it in the UK during the November and December 2017. Lau combine stunning musicianship with a ground-breaking yet playful approach to traditional music that transcends the music they hold dear, creating a cutting edge sound which garners praise from far beyond the roots scene. Prepare to be wowed by the wildly inventive Martin Green on accordian keys and effects, Aidan O’Rourke’s impossibly beautiful fiddle playing, Kris Drever’s virtuoso guitar and honeyed baritone voice, not to mention some excellent on stage banter and chemistry between the band.